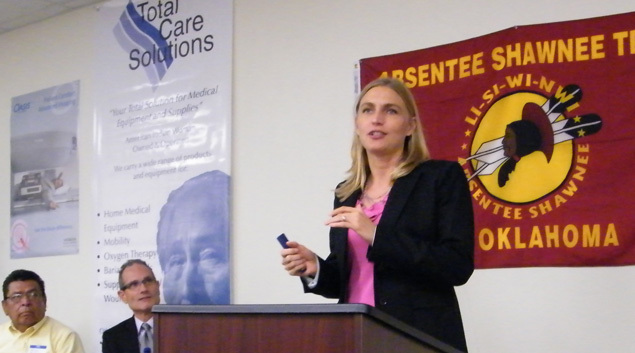 Terri White, director of the Oklahoma Department of Mental Health, speaks at a conference on addiction in June. Identified as a high priority by Gov. Mary Fallin and legislative leaders, the Oklahoma Department of Mental Health and Substance Abuse Services was one of a handful of state agencies to receive an overall budget increase for fiscal year 2013. In late May, the Oklahoma Legislature boosted funding for existing mental health programs by 3% to $192.9 million, a $5.7 million increase over 2012. Among larger state agencies, only the Departments of Transportation and Health and Human Services and the University Hospitals Authority received bigger percentage hikes. Mental health’s total appropriation was $311.4 million. The figure includes a $118.5 million transfer to take over functions previously assigned to the Oklahoma Health Care Authority. House Speaker Kris Steele, an advocate of “Smart on Crime” initiatives such as drug courts and treatment programs, helped secure passage of budget agreement. He said he was encouraged that mental health received priority consideration. Most of the $5.5 million increase will go toward the state’s matching share of the Systems of Care program, as well as the cost of opening a new crisis center in Oklahoma County. Another $667,000 will aid law enforcement by providing mental health screenings during the pre-booking process to determine the needs and risks of individual offenders. Mental health’s funding increase is significantly lower than what the department initially insisted it needed. During the lead-up to budget negotiations, it requested a minimum increase of $16.8 million to maintain current services. It said it would take a $144 million increase to fully fund all of the state’s mental health and substance abuse needs. While the budget increases fall short of those numbers, Commissioner Terri White said the department was happy with the final budget agreement. In an official statement, the department indicated it is still analyzing the impact and deciding how to allocate its funds. White said the new investments will help save lives and taxpayer dollars by preventing some of the negative consequences of untreated mental illness and substance abuse in Oklahoma communities. Under current law, the Oklahoma Health Care Authority oversees administration of Medicaid expenditures for behavioral health. After the $118.5 million transfer, the mental health department will take over negotiations with the federal Centers for Medicare and Medicaid Services on behavioral health functions. The department will establish provider definitions and criteria for medical necessity, set service definitions and service rates, contract with providers and authorize Medicaid payments for services. Since the mental health department has expertise in behavioral health and an existing network of providers, state officials said they hope is the transfer will prevent duplication of effort and lead to greater efficiency. The Systems of Care program is an evidence-based program that focuses on prevention and treatment for youth suffering from addiction or mental illness. According to the governor’s office, nearly 10 percent of young Oklahoman suffer from some form of mental illness. About 10% also suffer from drug or alcohol addiction. The SOC program provides comprehensive services to address those needs. The 2013 appropriation provides funding to help law enforcement conduct jail screenings for mental health and substance abuse. It also will finance a new crisis center in Oklahoma City, which should help reduce travel time for departments taking individuals for treatment. White said the jail screenings will help provide more accurate information about an individual’s mental health for law enforcement, district attorneys and courts. That information will be used to make eligibility decisions for such programs as drug and mental health courts and to better inform those involved about the needs of offenders. The National Association of State Alcohol and Drug Abuse Directors estimates that mental health and substance abuse problems cost Oklahoma $7.2 billion each year. It attributes $1.8 billion to direct expenditures, such as treatment, hospitalizations, law enforcement and corrections. Indirect costs for diminished productivity and other negative economic impacts account for $5.4 billion in annual losses. While funding is now beginning to increase, the mental health department is still well short of where it was before the economic downturn that began nearly five years ago. In addition to the reductions in state appropriations from 2009 through 2011, federal funding fell. Including federal grants and appropriations, the department’s 2012 budget was down by 11 percent to $289.9 million. White, Steele and Fallin stated they would like to pursue more funding increases, including money for at least four more crisis centers. Steele acknowledged that far more must be done to before Oklahoma can catch up with the rest of the nation.